This Atlas is one of several products intended to compile and share existing data that identify habitat of sockeye salmon in the Skeena watershed. 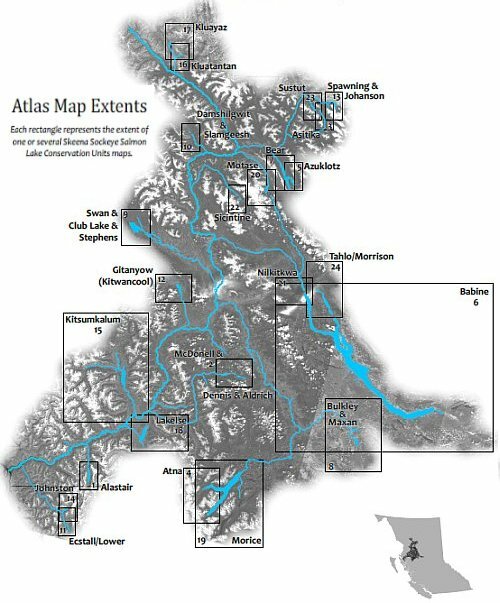 The Atlas focuses on displaying high-value freshwater habitat for recognized Conservation Units (CUs) of lake-rearing sockeye, a key component of the Wild Salmon Policy. The contents of the atlas can be accessed via the links below. The entire atlas can also be obtained on DVD by emailing skeena@psf.ca. All maps are 1:50,000 unless stated otherwise. Ecotrust Canada carried out this work in 2010 for the Habitat Subcommittee of the Skeena Watershed Initiative. Other products include an information poster, an annotated bibliography, and a collection of GIS files. Compile existing data about Skeena sockeye freshwater habitat and make this data available in a variety of formats suitable to different audiences.